Unlike its name cauli-Flower, the actual vegetable does not live up to its name...Or does it? Cauliflower is grown in Britain and is available all year round. It is also relatively cheap, hence the reason I have cooked with it today (2 for £1.50). The one time you will see it gracing the tables of peoples home including mine is as cauliflower cheese bake. So why do I and many others not welcome it in our homes. Is it because of the way it looks, its anti-social emissions or its bland taste. Well I think it is all of those things, as well as being quite a boring vegetable. Please feel free to disagree with me, these are just my thoughts on the vegetable. A little while ago I read that British cauliflower production had gone down by nearly a third in the last decade, as Brits preferred other imported vegetables. In an article, Phillip Effingham, Chairman of the Brassica Growers Association (BGA) in the U.K, an organisation behind a campaign to get us Brits to start eating more cauliflower said: 'Britain seems to have fallen out of love with the cauliflower over the last 10 years and sales have been declining steadily. We want to encourage people to rediscover this hugely versatile and healthy vegetable and help stop its decline’. As a person who has been growing her own and trying to eat with the seasons, the cauliflower has come into my kitchen more than six times this year, which for me is highly unusual. So am I a convert? The answer is still No. I still don’t like it much, perhaps there is something ingrained deep in my psyche that refuses to love and even like this vegetable, but what I have found in favour of the cauliflower if that I have come to appreciate its versatility in cooking, and you can’t say that about its relative the broccoli . I have eaten it roasted, boiled, steamed, pickled and raw. I have made cauliflower 'rice', cauliflower and wholegrain mustard quiche, paprika cauliflower and cauliflower, sun dried tomatoes, garlic and capers tart. Did you know that the leaves are also edible? To this day I am still experimenting with it. Other than eating cauliflower, I have also attempted to grow my own, but as of yet have not been successful. I think I know where I am going wrong. I am not preparing the ground well. So next year I need to pick up some tips and read on how to grow cauliflower as I am tempted to try different varieties, colours (green, purple and even orange) and compare flavours. 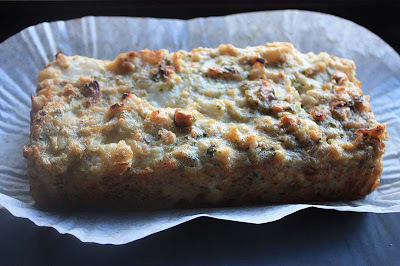 Anyway, after all that I actually think I may have found my favourite way to eat cauliflower and it is like this, as Cauliflower Terrine. 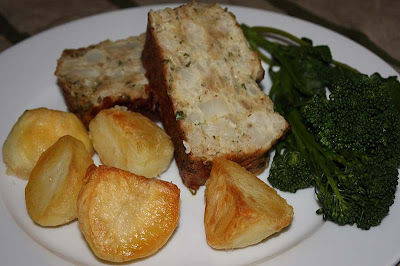 The terrine sliced beautifully too and was a good accompaniment to roast potatoes. I am submitting this recipe into this weeks Weekend Herb Blogging#212. WHB is a weekly food blog event showcases information and recipes about herbs, vegetables, fruits and other plant ingredients. WHB was initiated 4 years ago by Kalyn's Kitchen, it is now organized by Haalo of Cook (Almost) Anything At Least Once. This weeks host is the beautiful Marillyn from Just Making Noise. Preheat the oven to Gas mark 5. Grease a 2lb loaf tin. Either steam or boil the cauliflower, until soft. Drain well then roughly chop. Heat oil in a large pan, add the onion, garlic and fry gently until soft and transparent. Stir in the cauliflower pieces and parsley and cook for a few minutes. Remove from the heat, add egg yolks, breadcrumbs, seasoning, cayenne pepper and cream. Stir well. Whisk the egg whites until stiff then fold them into the cauliflower mixture. 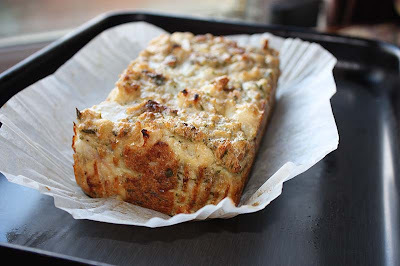 Put the mixture into the greased loaf tin, cover with foil and bake in the oven for 1 hour. Eat warm or cold. I was inspired by this recipe. I like cauliflower steamed with just butter, and also in a Chinese stir-fry or in Indian dishes - it seems to do well with strong flavors. I don't eat cauliflower very often. I like it in soup or with cheese sauce and sometimes serve it as a side vegetable, but I did get a rather good recipe from Wendy over at A Wee Bit of Cooking. She made a Cauliflower & Mushroom Pie, which was cauliflower and mushrooms in a bechamel sauce topped with puff pastry. I like your suggestion too. Steamed with just butter, oh your brave Kate. One of the dishes my husband loves is Aloo muttar gobi (potatoes, peas and cauliflower), it is one way I like eating cauliflower too. I may give it a go as a soup. I will check out your recipe recommendation, anything to encourage me to eat more cauliflower. I love your honesty and admire your perseverance with a vegetable you don't like very much. I use it mostly in soup as it lends a sort of creaminess when you're not adding dairy and doesn't overpower the flavour. Carrot and cauliflower, yummy. I must try it as soup, you the second person to say its a good way to eat cauliFlower! Over the past few months I have certainly begun to appreciate the cauliflower.